The Board of the Georgia Science Teachers Association serves as a voice for K-12 science teachers in Georgia. Would you, or someone you know be a good spokesperson for the needs of science instruction for students in Georgia? If so, please consider running for office, or nominating someone you think might serve the interests of teachers and students well. Board members meet regularly, both in person and electronically throughout the year, and coordinate the activities of GSTA. Several positions will need to be filled this coming year. Below are the positions and an introduction to the duties associated. A full description can be found in the GSTA Constitution. Secretary This position is a two-year commitment to serve in leadership of the organization. The Secretary maintains minutes of all GSTA meetings and serves on the Executive Board. Elementary and High School Level Representatives Each of these positions is a two-year commitment to serve in leadership of the organization. Duties include attending Board meetings and serving as a voice for elementary or high school teachers and students in the state. The level representative will solicit or write one article a year for the newsletter, support the program chair in soliciting presentations for the conference, and coordinate a level Share-A-Thon at the 2019 and 2020 conferences. District Representatives Each of these positions is a two-year commitment to serve in leadership of the organization. This person will speak at Board meetings representing the concerns of science teachers in their part of Georgia. The representative will support membership in their district through disseminating information and helping GSTA provide quality professional development in their area. 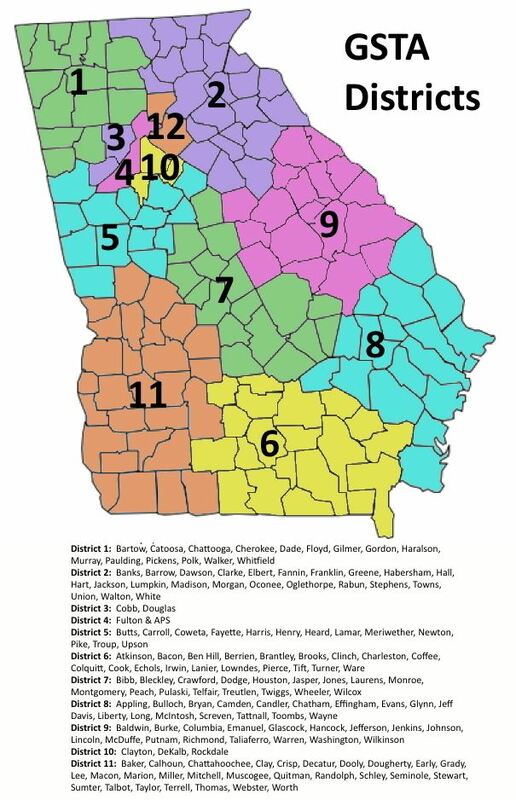 Even-numbered districts (2, 4, 6, 8, 10, & 12) are open for candidates during this election who work in these districts.